"Androgenetic" redirects here. For androgenetic alopecia, see Pattern hair loss. In botany, apomixis was defined by Hans Winkler as replacement of the normal sexual reproduction by asexual reproduction, without fertilization. Its etymology is Greek for "away from" + "mixing". This definition notably does not mention meiosis. 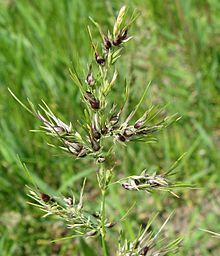 Thus "normal asexual reproduction" of plants, such as propagation from cuttings or leaves, has never been considered to be apomixis, but replacement of the seed by a plantlet or replacement of the flower by bulbils were categorized as types of apomixis. Apomictically produced offspring are genetically identical to the parent plant. Because apomictic plants are genetically identical from one generation to the next, each lineage has some of the characters of a true species, maintaining distinctions from other apomictic lineages within the same genus, while having much smaller differences than is normal between species of most genera. They are therefore often called microspecies. In some genera, it is possible to identify and name hundreds or even thousands of microspecies, which may be grouped together as species aggregates, typically listed in floras with the convention "Genus species agg." (such as the bramble, Rubus fruticosus agg.). In some plant families, genera with apomixis are quite common, for example in Asteraceae, Poaceae, and Rosaceae. Examples of apomixis can be found in the genera Crataegus (hawthorns), Amelanchier (shadbush), Sorbus (rowans and whitebeams), Rubus (brambles or blackberries), Poa (meadow grasses), Nardus stricta (Matgrass), Hieracium (hawkweeds) and Taraxacum (dandelions). Apomixis is reported to occur in about 10% of globally extant ferns. Among polystichoid ferns, apomixis evolved several times independently in three different clades. Agamospermy, asexual reproduction through seeds, occurs in flowering plants through many different mechanisms and a simple hierarchical classification of the different types is not possible. Consequently, there are almost as many different usages of terminology for apomixis in angiosperms as there are authors on the subject. For English speakers, Maheshwari 1950 is very influential. German speakers might prefer to consult Rutishauser 1967. Some older text books on the basis of misinformation (that the egg cell in a meiotically unreduced gametophyte can never be fertilized) attempted to reform the terminology to match the term parthenogenesis as it is used in zoology, and this continues to cause much confusion. ^ Winkler, H. (1908). "Über Parthenogenesis und Apogamie im Pflanzenreich". Progressus Rei Botanicae. 2 (3): 293–454. ^ a b Ross A. Bicknell; Anna M. Koltunow (2004). "Understanding Apomixis: Recent Advances and Remaining Conundrums". The Plant Cell. 16 (suppl 1): S228–S245. doi:10.1105/tpc.017921. PMC 2643386. PMID 15131250. ^ Clausen, J. (1954). "Partial apomixis as an equilibrium system". Caryologia. 1954, Supplement: 469–479. ^ a b Savidan, Y.H. (2000). Apomixis: genetics and breeding. Plant Breeding Reviews. 18. pp. 13–86. doi:10.1002/9780470650158.ch2. ISBN 9780470650158. ^ Steil, W.N. (1939). "Apogamy, apospory, and parthenogenesis in the Pteridophytes". The Botanical Review. 5 (8): 433–453. doi:10.1007/bf02878704. ^ Niklas, K.J. (1997). The evolutionary biology of plants. Chicago: The University of Chicago press. ISBN 9780226580838. ^ a b Maheshwari, P. 1950. An introduction to the embryology of the angiosperms. McGraw-Hill, New York. ^ a b Rutishauser, A. 1969. Embryologie und Fortpflanzungsbiologie der Angiospermen: eine Einführung. Springer-Verlag, Wien. ^ a b c d Nogler, G.A. 1984. Gametophytic apomixis. In Embryology of angiosperms. Edited by B.M. Johri. Springer, Berlin, Germany. pp. 475–518. ^ Carman, J.G. (1997). "Asynchronous expression of duplicate genes in angiosperms may cause apomixis, bispory, tetraspory, and polyembryony". Biological Journal of the Linnean Society. 61 (1): 51–94. doi:10.1111/j.1095-8312.1997.tb01778.x. ^ a b Nygren, A. (1967). "Apomixis in the angiosperms". In W. Ruhland (ed.). Handbuch der Pflanzenphysiologie. 18. Berlin: Springer-Verlag. pp. 551–596. ^ a b Koltunow, A.M.; Johnson, S.D. ; Bicknell, R.A. (2000). "Apomixis is not developmentally conserved in related, genetically characterized Hieracium plants of varying ploidy". Sexual Plant Reproduction. 12 (5): 253–266. doi:10.1007/s004970050193. ^ Christian Pichot; Benjamin Liens; Juana L. Rivera Nava; Julien B. Bachelier; Mohamed El Maâtaoui (January 2008). "Cypress Surrogate Mother Produces Haploid Progeny From Alien Pollen". Genetics. 178 (1): 379–383. doi:10.1534/genetics.107.080572. PMC 2206086. PMID 18202380. ^ Christian Pichot; Bruno Fady; Isabelle Hochu (2000). "Lack of mother tree alleles in zymograms of Cupressus dupreziana A. Camus embryos" (PDF). Annals of Forest Science. 57: 17–22. doi:10.1051/forest:2000108. ^ Pichot, C.; El Maataoui, M.; Raddi, S.; Raddi, P. (2001). "Conservation: Surrogate mother for endangered Cupressus". Nature. 412 (6842): 39. doi:10.1038/35083687. PMID 11452293. ^ a b Solntzeva, M.P. (2003). "About some terms of apomixis: pseudogamy and androgenesis". Biologia. 58 (1): 1–7.